Reality TV star and social media queen, Khloe Kardashian has given Cocoa Brown her Seal of approval! Having the ability to influence the globe to instantly purchase anything she endorses, it’s only natural that the Golden Goddess Shimmery Dry Body Oil has become a huge hit! Khloe first discovered the Golden Goddess oil through her makeup artist, Joyce Bonelli, leader of the Kardashian Glam Squad! As a firm family friend, you’ll find her at all the Kardashian family functions; weddings, birthdays, you name it! She’s even appeared in the hit reality TV show, Keeping up with the Kardashians too. Joyce was sent a sample of the range from Irish tan brand, Cocoa Brown, and fell in love! She tested out a number of products on both Kylie and Khloe and decided to join the Cocoa Brown family as the global brand ambassador. The rest is history! So, starting with the packaging… It comes with a magical pump to dispense the product but you need to give the bottle a good shake before use as the oil and shimmer separate – it’s like looking in to the sand dunes! It’s presented in a luxurious looking glass compact with a gold top. It’s really sturdy and has a great design, making it the perfect addition to your make-up display! The sand dunes got GLOW for DAYS! They say it’s what’s on the inside that counts and I must say, I’m really impressed with this too! The oil creates a silky smooth finish with a subtle shimmer, creating a fantastic overall glow. It blends really well and is super buildable which means you can create either a subtle look or go full-on glamtastic, the choice is yours! It can be used to highlight the face or all over the body, enabling you to create the perfect ‘celebrity limb’. If you’re anything like me, you’ll hear the word ‘oil’ and immediately think of break-outs. But this product is non-comodegenic, meaning it won’t block pores and cause spots! It’s non-greasy so doesn’t leave your skin feeling oily and tacky either, which allows for that all-important last minute tanning sesh! If you’re not a huge fan of self-tan then don’t worry, as this is perfect for non-tanners too. For those of you who are all about the golden glow though – partner this up with Cocoa Brown’s 1 hour tan. 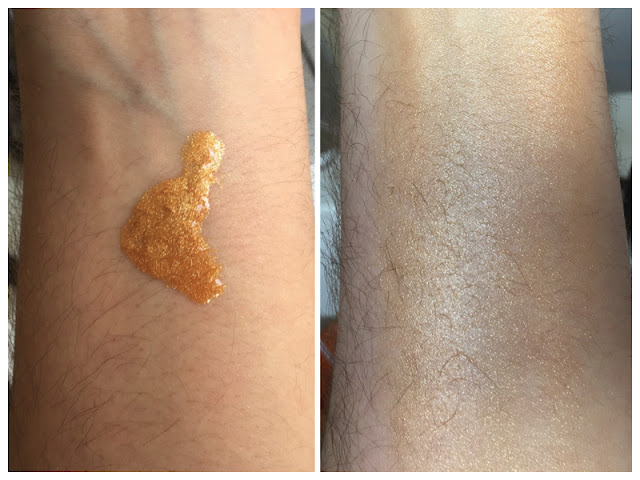 It has excellent lasting power and gives a real unique highlight to the skin, really bringing the meaning of ‘Golden Goddess’ to life. On top of this, it smells absolutely delicious! It has such a fresh and endless summery scent – It’s the best smelling highlighter in the world, fact! Now, I have to tell you that this is detectable on the skin so isn’t suitable for the ‘no makeup, makeup’ look, but for those wanting 'glow for days' this is guaranteed to tick all the boxes. So all in all, another fabulous product from Cocoa Brown, and if it’s good enough for Khloe, it’s good enough for us! You can pick up your Golden Goddess at a very affordable £9.99 from Superdrugs!